If you care about having fish to eat, recreational fishing, and enjoying a natural environment then you should be responding to the governments consultation document on a proposed Marine Protected Areas Act by 5pm tomorrow Friday 11th March 2016. Along with the recent decision to extend the Kermadec Islands Marine Reserve out to the Exclusive Economic Zone (EEZ) – 200 nautical miles – the proposed Act is good news in many ways because the 1971 Marine Reserves Act is outdated and badly in need of an overhaul. This opportunity also raises other options to be considered, including creating a new Marine Protected Areas Act that will include wider conservation and fishing management measures. But is a Marine Protected Areas Act the right way to go? We argue that of the changes proposed: (1) some are long overdue and welcome; (2) some fall short; (3) others questionable; and (4) some out of scope of a nature conservation Act. 1. The consultation document rightly identifies shortcomings of the 1971 Marine Reserves Act. Its original purpose was to support scientific research whereas in practice the reserves are about conservation, and it is the conservation of the reserves that provides the benefit to science. The reserves are the reference areas to judge how human activities have impacted areas outside them. Another worthwhile update is to improve the process of consultation in creating reserves, including recognition of customary rights and values as afforded by Treaty of Waitangi obligations. Through the recognition of customary rights and values, the proposed Act embodies the spirit of kaitiakitanga in principle, and affords the opportunity for kaitiakitanga to be implemented in practice. Critical to achieving this will be embracing mātauranga and the diversity of views amongst Māori. 2. The document notes the limitation of the Marine Reserves Act in its lack of scope outside the Territorial Sea when New Zealand has a responsibility to protect its Exclusive Economic Zone (EEZ). Thus special legislation is needed whenever the government wants to protect an area in the EEZ. It is thus a shortcoming that the proposed Act excludes the EEZ because including it could give the government the legislation to more efficiently manage its resources. Establishing a network of areas that are worth protecting for fisheries and biodiversity in the EEZ would have multiple long-term benefits for future generations, including: protection of fishery broodstock; breeding fish would be larger and thus produce more eggs which would contribute to fisheries; young fish would ‘spillover’ from these areas into adjacent fishery areas; habitats with slow-growing and delicate species such as corals could flourish and harbour biodiversity (including species of present and potential future social, cultural and economic importance). In addition, these reserves would provide a reference against which the effects of fishing and other activities in adjacent areas could be judged. For example, they would help us know whether changes in fish stock abundance are due to natural causes or fishing. Without a representative network of reserves we do not know how natural or healthy other areas are. Moreover, a reserve network in the EEZ would help to give clarity to where seabed resources could be extracted from. 3. 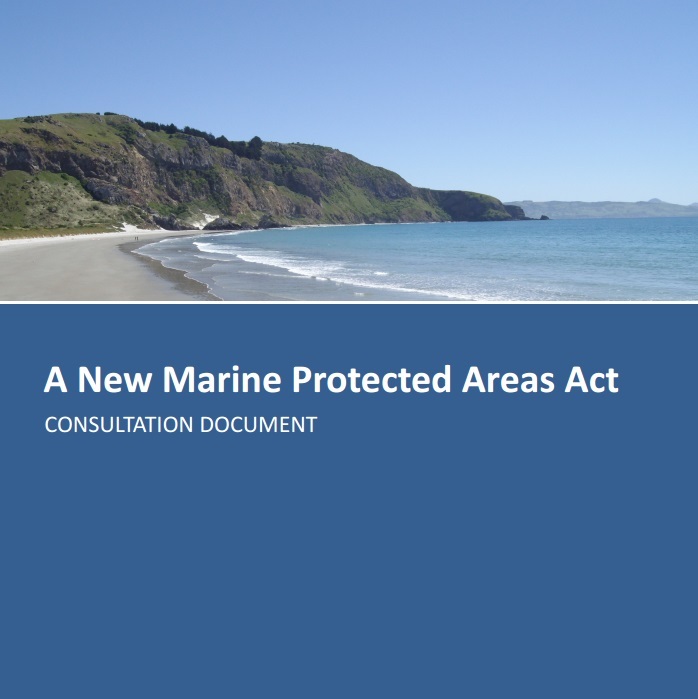 A second element of the Consultation document is a proposal to include marine sanctuaries within the new Act. These are areas where dolphins, whales and seals are given special protection. These animals are already protected within New Zealand’s seas wherever they occur. Sanctuaries can involve additional restrictions of fishing gear that may accidentally kill these animals. However, such restrictions can be applied anywhere at any time using fishing regulations. If there are areas that are critical to these animals survival, such as breeding or feeding grounds, then these areas could be protected as Marine Reserves so as to also conserve their food sources. Having a healthy population of an endangered species requires not only measures to avoid accidentally killing them, but also their having a suitable habitat with adequate food. 4. A new proposal is to create Recreational Fishing Parks in the Hauraki Gulf and Marlborough Sounds. This recognises that recreational fishing pressure has been increasing and will continue to as more people wish to enjoy fishing. It will exclude commercial fishing from these areas, UNLESS they are species not targeted for recreation. Thus these will not be ‘recreation only’ fishing areas despite the proposed name. However, calling an area a Recreational Fishing Park is likely to attract more recreational fishing because of an expectation that fishing there will be better than elsewhere. Creating Recreational Fishing Parks implies additional controls on recreational fishing but it is not stated what they may be. Without such restraint near urban centres there will be less and less fish over time. Perhaps reluctantly, people already accept limits on what fish they can catch. For example, methods which kill non-target species or more fish than a person’s quota should be banned. Without some restraint we could end up with only catch-release recreational fishing and stricter fee-paying permitting systems as occur in other countries. However, this is all about fishing, not conservation of biodiversity. It matters not to the fish whether their death will mean they are sold (~commercial) or not (~recreational). Removing the largest fish, as usually happens quickly with either commercial or recreational fishing, has knock-on effects of food webs because these fish dominate the ecosystem by being top predators and producing more young than smaller fish. All fishing requires similar information to manage stocks and there are existing regulations to control fishing. These areas should not then be within a Marine Protected Areas Act and may be best managed by fishery regulations. So what should the new Act be called? The term Marine Protected Area has become so loosely applied around the world that it is meaningless. Over 94% of MPA in the world allow fishing and thus cannot protect biodiversity in a natural state. All the ocean is protected in some ways, such as controls on pollution, fishing, mining, and where ships travel. Creating a new Act with such a name is not progress. If the Marine Reserves Act needs to be replaced by an Act with a different name, then would a “Marine Conservation” Act be a better name? The focus would clearly be on conservation, not fishery management. It could include measures to protect species threatened with extinction outside of Marine Reserves for example. Do we need more protected areas now? The ocean is relatively pristine compared to land so do we need to be concerned about its future health yet? People have already altered marine ecosystems at global scales through removing millions of large animals, notably the great whales and larger fish. Reserves are a free insurance policy because nature can restore itself within them. In contrast, piecemeal regulations to protect biodiversity are expensive to manage and more complicated (and costly) to police. Furthermore, reserves directly benefit fishing through spillover and increased production of young fish into the ecosystem. Reserves have value to society through present and future benefits to commercial and recreational fisheries, protecting and learning about natural biodiversity, and provided customary rights and values are recognised, to enhancing and conserving mauri. 1. Update the purpose of creating Marine Reserves and the consultation process to deliver Crown Treaty of Waitangi obligations and modern best practice. 2. Include the EEZ in the new Act. 3. Begin a process to identify a network of Marine Reserves within the EEZ within five years. 4. Take measures to prevent accidental killing of endangered species wherever they occur. 5. Regulate ‘Recreational Fishing’ outside of a conservation Act. 6. Establish Marine Reserves to protect the most important breeding and feeding locations for endangered species within the EEZ. 7. Establish Marine Reserves where they can bring maximum benefit to commercial and recreational fishing within the EEZ. 8. Make the Kermadec Island Marine Reserve the first action following the update of the Marine Reserves Act. Hi there – I wrote to the Minister/ministry about the reason for exclusion of the EEZ and received a reply. Did you? If you did, what did the reply say? I sent my views to Minister last week. I am not necessarily expecting a personal reply as it would be part of the consultation. So I do not known the full rationale about some of the proposals in the consultation document. You sent your views. It seems to me that given the very short treatment of the EEZ issue in the introduction to the consultation document, that the reasons behind things might be of interest before telling the government what you think it should do.